They say first impressions are everything, and Casa do Bairro B&B in Santa Catarina has been paying attention. Even before we arrived we were treated to a friendly but informative exchange of emails, and the first thing we noticed when we finally arrived was the scent of fresh lavender in the pretty courtyard. From there, things just got better and better. We were greeted by Portuguese-for-John. After we had settled into our (lovely) room, he sat us down to give us a brief introduction to Lisbon. The B&B provides a map of the city centre, and they’ve marked some of their personal recommendations for restaurants, bars, museums and other attractions on there: we probably would’t have ventured into either the Cantinho da Paz restaurant (to be discussed in more detail in tomorrow’s Food Friday – make sure you check back! ), or the Fashion and Design Museum without this guidance, and both turned out to be fantastic finds. Portuguese-for-John also highlighted some of his particular favourites of the highlighted attractions and gave us a brief introduction to the city in general. His main tip? “Get lost”. Excellent advice, as it turns out. Throughout our stay the staff were always friendly and willing to help in any way they could without overstepping the mark – perfect hosts! But it wasn’t just the staff that made this B&B. Although the interiors weren’t anything fancy, they were modern, clean and more than adequate. We even had a tiny bit of a sea view from our window. The location in Santa Catarina was perfect for us: close to the bars of the Bairro Alto without being in the midst of the action and noise, and within walking distance of the main city centre, stops for the famous Tram 28 route and other tram and train stops that will take you to Bélem, Sintra and Cascais. I particularly loved being so close to the Placa de Santa Catarina, a square and miradouro that up fills up with younger, bohemian Lisboetas during summer afternoons. The ideal location for a €1 glass of sangria sipped from a plastic cup under the Portuguese sun. Talking of food, there is also an honesty fridge. It is a little more expensive than the nearby supermarkets and shops, but still a fair price if you want to pick something up without having to venture out. If you prefer to be a bit more independent on your travels, the B&B also owns some nearby apartments. 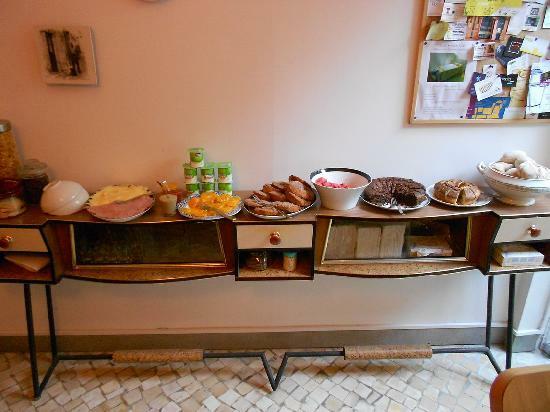 You can even get in on the B&B breakfast for €7 per person – it may sound steep, but it’s probably worth it one day, providing the French Toast is on offer. There’s a reason the Casa do Bairro currently holds the number one B&B spot on TripAdvisor. A friendly and calm escape with a modern but homely feel in a great location, this really is an exceptional place to stay when in Lisbon. All rooms have a private bathroom, television and bright colours!